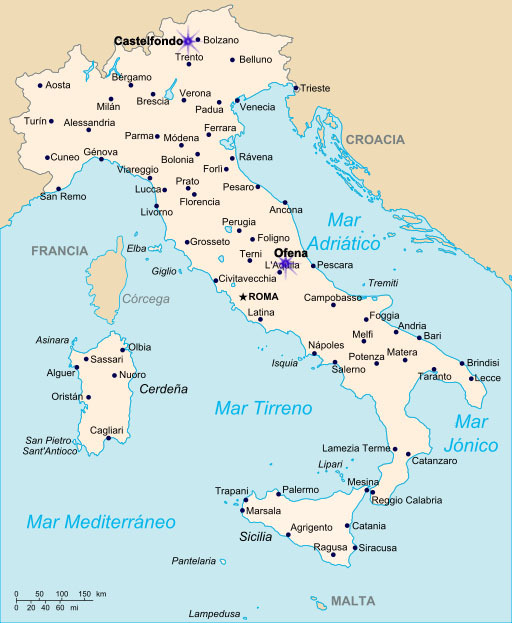 Map of modern-day Italy showing the villages of Ofena in southern Italy and the village of Castelfondo in northern Italy. Several weeks ago I received a curious email from a gentleman with the surname of Genetti. According to his email, “D. Genetti’s” family had settled in New England in the 1920’s. He gave me the names of his great-grandparents, but missing was information about their village of origin in Italy. I had heard of a Genetti family in this part of the country, but had never come across their ancestry in my research. Since most branches of our family settled in mining areas of the United States, I’ve found it easy to track the immigration of each branch to a specific coal mining region of this country. But I had not found any branch of the Genetti family (originally from Castelfondo) who emigrating to Massachusetts. In his second email, my new Genetti contact provided a detailed family tree, extending back nine generations, beginning with Giovanni Genetti (1737-1839). I responded enthusiastically – yes! I would be happy to include his genealogy on our online family tree. But first it was necessary to document and verify the names and dates on his tree. I had learned from past experience that information provided without resource documentation can often contain errors. So I set about researching his ancestors. What I found was a complete surprise! “According to your tree, the earliest Genetti ancestor is Giovanni Genetti (1737-1839). I was unable to locate him on our ancestral tree (which dates back to 1461) nor in the Castelfondo baptismal records. I did further searching on Ancestry.com and FamilySearch.org, but without any luck. Then I attempted to search for recent ancestors on your tree that were born in Italy and emigrated to the USA. Still I found none of these relatives in the data bases with the name of Genetti. My last resort was searching for derivative spellings of Genetti. I then found an Italian family tree on Ancestry.com with five generations of your relatives listed along with corresponding birth and death dates – but their name was spelled “Genitti” and they were from Ofena, L’Aguila, Italy – not Castelfondo, Tyrol. When I searched FamilySearch.org for Genitti, I found results that matched what I had found on Ancestry.com. As a genealogist, I have an insatiable curiosity! I had to know more about this family. So after sending my email (and not feeling very good about breaking this surprising news concerning a mistaken surname! ), I continued digging to find answers. Here’s what I found. “D. Genetti’s” 2nd great-grandfather arrived in Canada from Italy in 1921 under the name Pasquale Genitti. The family must have traveled to the United States soon after, settling in Massachusetts. That same year, Pasquale’s son, Giuseppe married and the Massachusetts Marriage Index lists his name interestingly as “Giuseppe Genetti”. The 1930 Federal Census states the family’s surname is “Genett”. And in the 1940 Census, it becomes “Genetti”. Misspelled names are a common occurrence in the census since it is the sole responsibility of the census taker to notate the information correctly. Unfortunately, names were often written phonetically, and therefore misspelled. The errors on the 1930 and 1940 censuses could account for the family simply adopting a new version of their name. However, other documentation provided the following information. World War I and World War II registration cards, as well as naturalization documentation for one of Giuseppe’s immediate family members, states the surname to be “Genitti”. And the Social Security Death Index states that Giuseppe’s own surname at the time of his birth in 1890 and at his death in 1968 was “Genitti”. But whomever had constructed their detailed family tree, had decided to use the surname “Genetti” throughout, rather than reflect the new name within the generation that had adopted the change. It was obvious that my email friend was two to three generations separated from his family’s name change and not aware of the true origins of his ancestry. Hopefully the information provided in this “case of mistaken identity” was not too shocking. I trust it will be used as positive motivation to research the family’s true roots, ancestry and culture.